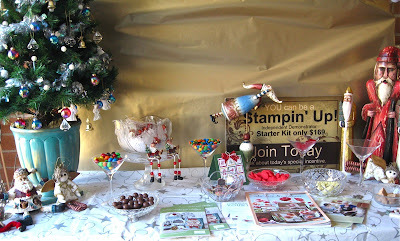 Tonight I have a scrap page that was one of the projects prepared for my Christmas In July event last weekend. Actually my sister Linda created the page from a map that I designed and it was amazing to see the various ways this inspiration took the 10 guests at the event. But before I show the Angel Scrap Page to you I thought you'd like to see the Lolly Bar that my daughter set up for us. And here is the scrap page featuring my little angel grand daughter. I wanted to show case the lovely ELEGANT BIRD die and the BIG SHOT, and as we were using that for other ornaments I decided to use the wings as Angel Wings. The card stock is adhered to the very sticky STICKY SHEET before passing through the Big Shot. Then the second layer is peeled off and the wings are dipped into a bowl of CHAMPAGNE STAMPIN' GLASS GLITTER. The background is created quickly using one of the gorgeous papers from MOCHA MORNING DSP. 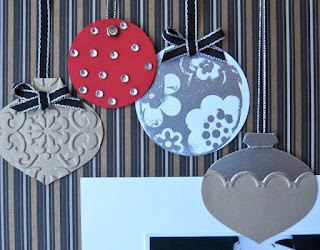 Linda had lots of fun playing with the ORNAMENT PUNCH and decided to try both DRY EMBOSSING and HEAT EMBOSSING with Silver Embossing Powder. The ornament on the bottom Right side is punched out in BRUSHED GOLD, embossed with one of the ADORNING ACCENTS embossing folders then the top was coloured with a VERSAMARKER and heat embossed with Silver. Another technique was used on the title which was stamped in Basic Black then coloured with a BLENDER PEN and Classic Inks. Lots of fun techniques for everyone to try out. This will have to be a quick post as I'm madly preparing for our annual Canberra Craft Fair and due to another interstate trip coming up - my time is really limited.